The two string quartets of Robert Simpson (b1921) recorded here form a pair. The Tenth Quartet (For Peace) (1983) was composed for the tenth anniversary of the Coull Quartet who gave its first performance at the University of Warwick in June 1984. 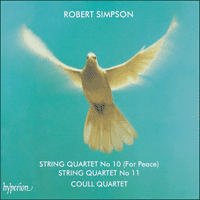 Robert Simpson followed this work almost immediately with a counterpart, the Eleventh Quartet (1984); again the premiere was given by the Coull Quartet, this time at Alfreton Hall, Derbyshire, in March 1985. The composer has also said that the last thing he wanted to perpetrate was yet another of those shrilly protesting screams of agony so common in proselytizing or propaganda works. We do not need to be reminded of the horrors of war Robert Simpson himself saw plenty of them as a pacifist during the Second World War working in London on a mobile surgical unit during the Blitzkrieg. The programmatic representation of horrors with which we are only too familiar can easily be theatrical, but music has the potential to express positively the nature of peace, as many great composers have shown. This Quartet shows that Simpson has learnt this lesson from such past masters. He has, in particular, appealed to our past heritage by making a firm commitment to fundamental and time-honoured principles (in a similar way, those facing the prospect of warfare in the nuclear age commonly appeal to all that is good in our heritage and find consolation in the beauties of nature). The sinewy interweaving of contrapuntal lines in this Quartet recalls the style of Elizabethan and Jacobean consort music, and the prominent use of the fifth (even, occasionally, as the interval at which parts are doubled) derives from the fundamental character of the instruments themselves. There are three movements, of which two large ones frame the brief Scherzo. Pedals and repeated notes (which are, after all, only a more dynamic form of pedal) play a large part in each movement. In addition, all three movements start with two parts that seem to grow out of a single pitch; and there is much use of a phrase that, as the composer puts it, 'rises through a natural (or flat) note and descends through a sharp one.' Each movement has one climactic point: in the first (a structure derived from sonata form) this comes when the second subject is given an enhanced recapitulation; in the Scherzo the climax appears and disappears very quickly — as does everything else in the movement; in the Finale the climax takes the form of a fugue which subsides into a Haydnesque epilogue of quiet graciousness based on all the elements used in the work up to that point. At the end the opposing sharp and flat keys are held in perfect balance, co-existing without any sense of strife to make a remarkable illustration of the condition of peace. The Eleventh Quartet takes some of its material from its predecessor, but strongly contrasts with that work by treating the material in a more energetic way. Unlike the Tenth Quartet it is turbulent and extremely intense for much of its length though it, too, ends with a slow movement. The composer has commented that he was conscious of the influence of Beethoven's String Quartet Op 95, in which a fierce concentration of material makes room for later expansions. Simpson's Quartet is in a single movement and a basic tempo that remains unchanged throughout, but it has four clearly identifiable sections. Violent contrasts are tne essence of this work. The opening Allegro molto is a tightly constructed exposition of the main elements: the tritone, the major third, and the up-and-down chromatic twist from the Tenth Quartet. An intensely polyphonie Adagio follows, and a large virtuoso Scherzo creeps in upon it, opening out little by little into a movement of tremendous energy in which much use is made of upward-rushing scales. These scales, being in duple time, conflict with the prevailing fast Eroica-style triple rhythm, and greatly add to the excitement and feeling of headlong rush. The movement develops as if it is going to turn into a Finale, but suddenly, as the music seems to be reaching a frenetic and exhilarating climax, everything disappears, leaving only thin air in its place. The most extreme contrast in ine work is now projected, for the Quartet ends with a very slow section marked ppp throughout. The basic shapes and intervals of the earlier sections are still there, but all is now de-humanized, remote and static, and it slowly drifts away into silence.